Fukushima is leading the problems, with the potential for shutting down the northern hemisphere of the planet, if the impending storms that are moving in, do any more damage. The blind-spot in Fukushima remains with Stuxnet which was built and implemented as an Israel-Amerikan secret weapon; designed to prevent Japan from shutting down their reactors when they were first hit, roughly 3 years ago. Stuxnet was probably not the only contributing factor but certainly it was the one that gave birth to this global-nightmare ­ with virtually no end in sight. Of course US media has remained silent, for the most part throughout the continuing disaster as it continues to unfold, while the world ignores what is about to happen to billions of people. The death of the Pacific Ocean is underway: That’s not something that the global-media has chosen to cover either. But the effects are real and cannot be contained! There are other ancillary spinoffs. BP, the Gulf of Mexico and the damage done to the Gulf-stream are lesser in the degree to which they will impact the planet—but collectively they all add up to the ending of what billions of people once knew as a world that was not headed for total destruction. That’s no longer the case. In North America the caldera in Yellowstone is building to an incredibly huge threat of eruption. Again there is damn little people seem to be able to do except to just “get out of the way”. I don’t know enough about the conditions or the potentials for eruption. Any changes, if any, that might have been altered by any of the same forces that are altering our air, our water and our soil throughout North America (And the World) are real - but I’d be willing to bet that HAARP and all the other filth that has been playing with global-weather since the 1970’s is not helping anyone avoid whatever might be happening inside Yellowstone. 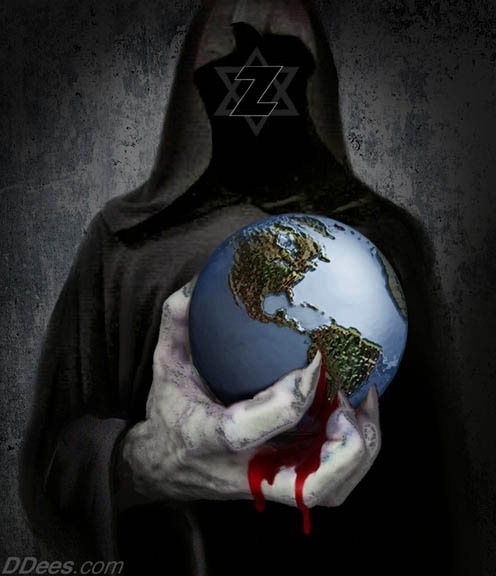 Those potential threats are coming directly from nature with assistance from the Rothschild’s banks and Israel with USI acting as military-enforcers for a slave-army that is “at war” across this planet. Attacking Iran with nuclear weapons! Total-Global-destruction is irrelevant to the current-paranoia in the Jewish State. In fact if anything: Should Fukushima worsen and become deeper or “world-ending”: Or if the impending global-financial-tsunami crashes the global-banks or even inadvertently starts WWIII ­ then Israel-today is so twisted, that she will probably use any “global-distraction” to launch her own nuclear attack upon Iran. That would happen because nothing can be allowed to divert Israel from pursuing their Greater State of Israel—even if the entire planet is about to become uninhabitable. Yesterday the government began playing-with the payments which they will allow or cut from EBT cards, in the U.S. AGAIN. By the First of November - word of these changes and cuts will have made the rounds and by the weekend, food-riots might become something that has to be dealt with nationwide. This alone could lead to runs on the banks, violence in the streets and possibly to long-sought and illegal Martial Law. That has always been the escape-hatch for the criminals to use to flee the scene of these crimes, for parts unknown! If the mercenary DHS troops respond with over-reactive force, as is their practice: Then everything will get massively worse almost immediately. And through it all there has been almost nothing launched by the people to stop any of this “unending-war” that Cheney promised we would all have to “live-with” back in 2002. Even if the above does NOT happen, there are so many other “known-unknowns” that can happen at any given time now: The slashing or cutting of Social Security, Medicare, Medicaid and the Vets, on top of whatever is being done with the EBT cards ­ it is very-doubtful that Americans will be able to get through the first week of November without being forcefully attacked by both the government and nature in additional ways. And “against this background” being “prepared for chaos” is not an answer to what we are soon about to face. TODAY: Lawyers from around the world are finally going-after the war-criminals in the United States. There are six primary charges. There are actually hundreds of charges, but these six are being focused on, in order to avoid becoming entangled in the massive amount of the charges that stem directly from both the Bush & the Obama administrations. “The first and the most serious (are) the illegal wars in Iraq and Afghanistan. This is a crime of Aggression. At Nuremberg this was the supreme crime of Aggression. The second violation of the law was the torture regime. That was set-up by Bush Officials and their legal mercenaries John Yoo, Jay Bibi and other lawyers. The Third violation is War Crimes ­ and War Crimes is considered as well, but the killing of civilians, the targeting of civilians two of the most notorious instances of war crimes. The Hyditha Massacre where U.S. Marines basically executed about 24 men women and children in cold blood. It was just horrific. And then the Fallujah Massacre which was done in retaliation for the deaths of four Blackwater mercenaries ~ civilians were targeted. US soldiers went house to house and took them out and shot them. They shot families crossing the river. Helicopters and snipers shot people ­ there were unknown numbers, hundreds of people were killed in Fallujah. Then the fourth violation of the law is the prison camp that the United States maintains at Guantanamo. Then the fifth example of law-breaking by the Bush Administration was the illegal spying programs. Surveillance programs, spying on Americans conversations and then data-mining programs. Very much like what we’ve heard lately from Edward Snowden. This global-problem was preceded by the fact that Impeachment in the U.S. was hindered from Bush through Obama - because the people responsible for bringing Impeachment charges were themselves totally immersed in the same crimes that these two administrations routinely committed. And of course this has a direct bearing on the how and why the people of the U.S. are now facing several seemingly impossible situations ­ simultaneously, as we all come up on November 2013! This latest development might just be the one terrifyingly quick unmasking of the reality of the really-ugly-truth. This has kept most Americans from seeing that which was staring us all in the face, over the last and totally criminal decades!